I am here in Clemson, South Carolina sitting at another (You guessed it) Starbucks. I went to the game in Atlanta last night, Braves playing the Cincinnati Reds. Braves won 5-4. I was impressed with the turn out. Highlight of the evening, only cost me a dollar! However, that was a “wolf in sheep clothing” fee. I sure didn’t like the cost of the food and beverages. In Turner Field, it was one price for the season ticket holders and another for everyone else! On Friday night home games, they do have a fireworks display which I enjoyed as I was walking back to my car. Getting in and out of the stadium area was a lot easier than I thought it was going to be. Atlanta traffic is some of the worst I have had to deal with, worse than Chicago and almost equal to Los Angeles. It was after 10 when I got on the road and figured I would get half way to Clemson, find a Walmart parking lot, and set-up for the night. I was hungry since I wasn’t going to pay those prices at the game. I found a Hooters ate and went to bed! Which brings me to today’s post, my routines. I have fallen into routines on this trek, baseball games, Starbucks, Motel 6, Walmart parking lots, even Hooters about once a week (seriously they have the best wings). These are my “comfort zones on the road”. Places I can count on day to day. It’s kinda strange how this has happened, but I now know what to expect at all of them. Lots of people ask me why do you stay at Motel 6? The truth is because it is inexpensive but also I know what I am walking into, my expectations are not very high. When I get into my room I take the bedding off to the bottom sheet, I put my own bedding down. I get an alcohol wipe to clean the TV remote, I turn the TV on and go through all the channels to make sure the Television is working correctly. If there is a refrigerator I unplug it (makes way to much noise). I make sure I have my flip flops next to the bed (don’t want to touch the carpet and remodeled units have laminate flooring). I then plug in all my electronics to get them charged. I check for “laundry room” availability. I wish I could say they are in better shape than my room, but usually a mess. Taking my precautions, I clean up the machines before I use them. I have been able to do laundry once a week. There are days that I take advantage of the usual checkout time, which is either 11 a.m. or noon. Going in and out of different time zones catches up with one traveling; therefore, sometimes I sleep in late. When I get to a Starbucks in the morning the first thing I do is find a table near a power outlet, claim that table by putting all my stuff on it and then get in line. I usually get the following items, Evolution Sweet Greens (if they have it, some don’t) Tall “Pike Place” coffee, Bacon Breakfast sandwich and a bottle of water (if I didn’t drink one first thing in the morning). I then spend 3-4 hours surfing the internet, planning out the game I will be attending, in addition to typing up the daily post. The Starbucks experience is almost the same everywhere you go. I guess that is the goal, however some are dirtier than others. I check the bathroom right away to see if it is clean, if it is I am able to relax. If it isn’t, I tend to get a little jumpy like something is on my skin. I really should contact them. They would be a great sponsor and I could send them a report on the all the stores! As far as the Walmart parking lot experience goes, I usually show up after 10 pm, before 10 I usually go to a Motel 6. At Walmart, first I look for the campers in the lot and park near them. In the event there aren’t any, I look for where the semi’s are parked and pull-up along side of them. Walmart asks that you park in the back of the lot. I try to find an island curb area to park next to. Preferably the passenger side to the curb (I feel safer this way for whatever reason). Once parked, my detail to get my car set-up for rest and relaxation takes me about 5 minutes. (check out my website and interview to see how I do some of this) I make sure I have a large empty bottle with me. Why, you may ask? Just in case I have to go to the bathroom in the middle of the night! I usually read for a half hour before I go to sleep, it helps me relax and gets me used to the noises in the lot. Most lots sound the same but every night I have slept in one I’ve had to adjust to that particular one. 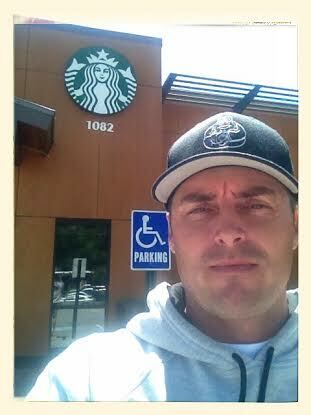 When I stay in the lots I go to Starbucks to wash my face and brush my teeth. It helps that I always have my “man bag” to keep my necessities. I really do go to Hooters for the chicken wings. I always get the 10 piece, breaded, mild with a side of blue cheese. I rarely eat all of them since they can be a little heavy and greasy. I usually get a Lemonade or a water, I will sit at the bar 90% of the time. It is 50/50 if I get one of the Hooters girls to wait on me. The Manager, who is normally a guy, does if they don’t. He also seems to apologize that I had to wait so long. I really don’t notice since I am either on Facebook or watching Sports Center on one of their TVs. I eat quickly since it is usually late and I am tired. I have noticed the “girls” are always really nice when they bring you the check, making sure that they get a good tip. But, they will not get rich off of me on this trip, I am not a great tipper and stick with the usual 15%, which doesn’t crimp by budget too badly. What bothers me the most is I haven’t worked out since I left Florida. I want to get up and at least run once in awhile but I haven’t done it. So, I worry that I will digress to where I was five years ago. If you haven’t read my life changing experience, read Day 63 “The Elliptical”. My days go by so fast and this I did not expect! Hopefully, I will eventually work some physical exercise into these routines. NOTE: I updated by biography since I hadn’t really touched it in three months. Click here if you would like to check it out: “biography“. That will get you where you want to “look”. If you have read it before, just scroll down and look for the update from this past week.